Railpictures.ca - Robert Farkas Photo: Crown Zellerbach 4097 is in Ladysmith, British Columbia on August 7, 1974. The original slide had almost total shadow on the trucks, etc., but thankfully Lightroom and Photoshop helped pull out some truck detail. | Railpictures.ca – Canadian Railway Photography – photographie ferroviaire Canadienne. 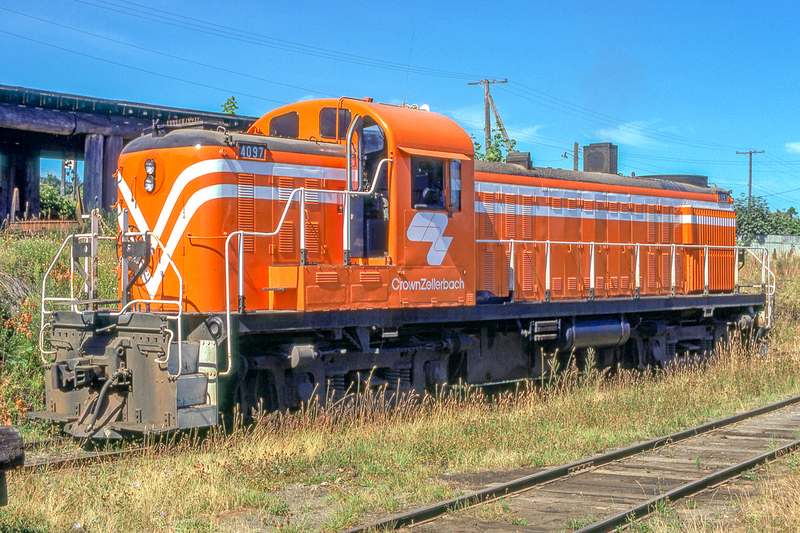 Caption: Crown Zellerbach 4097 is in Ladysmith, British Columbia on August 7, 1974. The original slide had almost total shadow on the trucks, etc., but thankfully Lightroom and Photoshop helped pull out some truck detail. Thanks, Raymond. It had the likings of something D&H. My ‘sniffer’ still works. Now thats damn nice. Is it an old D&H unit? Nice work on the edit and this is a nice paint scheme for an industrial locomotive.